The International Organization for Migration (IOM) said in a report on Saturday that more than 669,000 illegal immigrants of 41 different nationalities are currently in Libya. 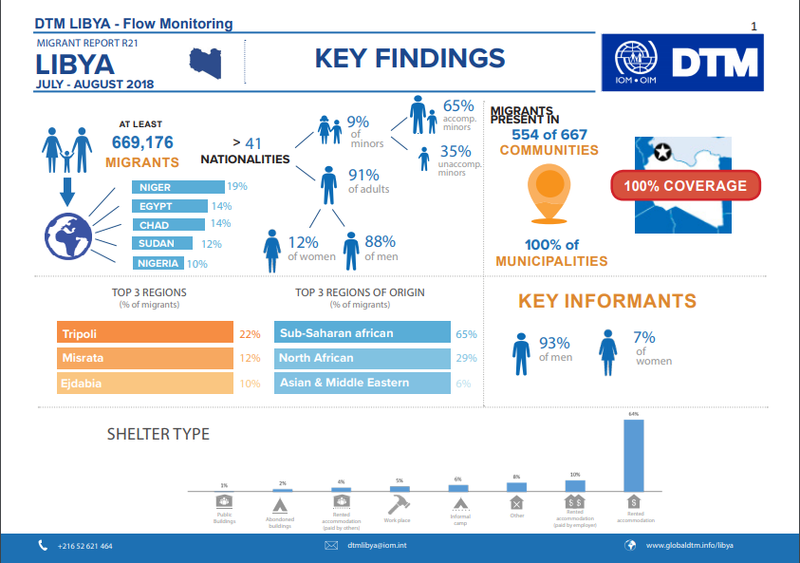 IOM said that in July and August 2018, IOM identified at least 669,176 migrants currently in Libya. "Migrants were identified in 100 municipalities, within 554 communities and originated from more than 41 countries," IOM said. IOM said that the top 5 nationalities identified are from Niger, Egypt, Chad, Sudan and Nigeria, saying 12% of the whole number is women and 9% is children. The report detailed that 60% of both African and Asian migrants were identified in Libya’s western areas, with the highest concentration in Tripoli and surrounding areas. "Other identified migrants were split between east and south (21.5% and 18.5% respectively). However, the south hosts 20% of African migrants identified, while only few Asian and Middle-Eastern migrants were identified there (only 1% of Asian and Middle-Eastern migrants in Libya were identified in the south)." The report says. Meanwhile on Friday, the United Nations High Commissioner for Refugees (UNHCR) said that Libya's coastguards rescued about 14.000 immigrants in 104 operations since the start of 2018. UNHCR also said earlier that there are about 8000 immigrants in 18 detention centers in Libya's capital Tripoli.